LGB Trains that are set up for Christmas, this is the 2009/10 layout . Santa comes to town! The night before Thanksgiving I usually operate special trains on my O scale layout for the Thanksgiving holiday, to simulate the heavy passenger load on the railroads during this time. I call it the “Thanksgiving Rush” and things can get interesting! To keep up with the high passenger demand, I add passenger equipment to virtually every train, making mixed consists of freight and passenger cars. This is the only day out of the entire year I do this. This video features all of my Thanksgiving Rush trains. The first two are normal trains – a Standard O freight led by my Lionel Norfolk Southern SD80MAC, and a 4-car Amtrak train powered by my MTH Genesis. Next off are two mixed trains – one powered by my Chicago & North Western Budd RDC by Ready Made Trains, and the other a mammoth consist of Amtrak passenger cars and O27 freight cars pulled by my Lionel BNSF SD70ACe. The last two trains are the Polar Express and a mixed train with my Norfolk Southern SD80MAC. Before these trains are assembled, you’ll get to see my Polar Express Berkshire showing off its pulling power, pulling the Amtrak-freight consist off of the layout. After the action is over, my NS SD80MAC pushes the cars of the “Nutcracker Express” into place and parks in the train yard. The holidays are here, everyone! Have a happy Thanksgiving! First Capital Connect . 319364 . Mill Hill Broadway Station . 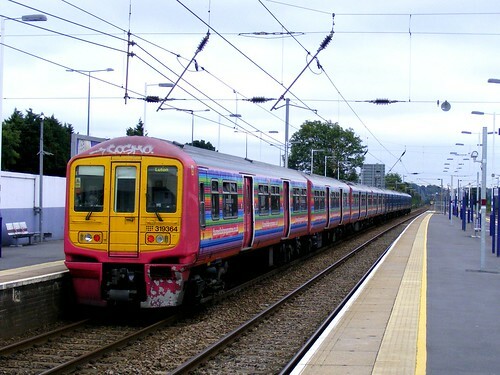 A rainbow train now with added graffiti ! The 1st May 2010 on the Battlefield Line Railway marked the Official 65th Anniversary of Thomas the Tank Engine. As usual, the Railway made sure this event was commemorated in style as I’m sure this video shows! At the beginning we see the event officially opened by a marching Silver Band and Thomas making a grand entrance as he breaks through the ribbon. Other attractions throughout the day featured: Engine races, brakevan rides with Fergus, sing-a-long songs, story re-enactments, face painting, punch and judy, interactive model railway and a chance to fill up Thomas’s tanks. Highlights of the are: the engine races shown throughout, YouTuber Steampics being soacked with water at 5:50(!! ), the Water Pistol fight between drivers at 6:55, my favourite quote of the weekend at 8:40 over the tannoy system, the rather embarrasing ‘Wheels on Thomas’ dance at 9:03 (which I was requested to put on!) and the rather ‘sweet’ Birthday Coal Cake at the end of the video. Locomotives in Operation were: -Jinty No.47327 (Thomas) -LNER B1 No.1306 ‘Mayflower’ (Henry) -Aveling & Porter ‘Blue Circle’ (Fergus) -Class 25 No.D5217 (Boco) -Hybrid DMU Class 116 & Class 118 (Daisy) The whole reason for me going was to help run the Soar Valley Model Railway Clubs’ Interactive Model Railway layout which uses Thomas Stock from the Hornby range, helping to raise money for Rainbows Childrens Hospice in loughborough as well. Updated video of my 1 ft x 4 ft N-scale model layout based on the steam powered Hull-Oakes sawmill on the Bailey Branch in Dawson, Oregon. The mill is a real-life “Inglenook” style switching puzzle since the empty cars have to be moved into position, and the full one moved out, all on a six mile dead-end spur. Check my other videos to see this action real life. More information and pictures at: dawson-station.blogspot.com I’m hoping the UMG clowns don’t own the copywrite to Stan Kistler’s 1959 “Whistles in the Woods”. I’m getting tired of getting my soundtracks gagged by Youtube! Phil Collins performs: “Going Back” from his new album “Going Back”, live at: ‘Deutscher Radiopreis’ 2010 in Hamburg on September, 17th 2010. *Please Check out my other Videos! MrPhil46.